محمدی آچاچلویی, محسن, احمدی, حسین, پورطهماسی, کامبیز. (1393). مطالعه تیمار روغن بزرک در چوب کبوده (Populus alba L.) به‌عنوان تیمار سنتی آثار تاریخی چوبی در برابر هوازدگی. مجله صنایع چوب و کاغذ ایران, 5(2), 93-106. محسن محمدی آچاچلویی; حسین احمدی; کامبیز پورطهماسی. "مطالعه تیمار روغن بزرک در چوب کبوده (Populus alba L.) به‌عنوان تیمار سنتی آثار تاریخی چوبی در برابر هوازدگی". مجله صنایع چوب و کاغذ ایران, 5, 2, 1393, 93-106. محمدی آچاچلویی, محسن, احمدی, حسین, پورطهماسی, کامبیز. (1393). 'مطالعه تیمار روغن بزرک در چوب کبوده (Populus alba L.) به‌عنوان تیمار سنتی آثار تاریخی چوبی در برابر هوازدگی', مجله صنایع چوب و کاغذ ایران, 5(2), pp. 93-106. محمدی آچاچلویی, محسن, احمدی, حسین, پورطهماسی, کامبیز. مطالعه تیمار روغن بزرک در چوب کبوده (Populus alba L.) به‌عنوان تیمار سنتی آثار تاریخی چوبی در برابر هوازدگی. مجله صنایع چوب و کاغذ ایران, 1393; 5(2): 93-106. Feist, W.C., 1990. Outdoor wood weathering and protection. In: Archaeological wood: properties, chemistry, and preservation. American Chemical Society, Washington DC, p 263–298. Unger, A., Schniewind, A. P., and Unger, W., 2001. Conservation of Wood Artifacts: A Handbook, springer, Berlin, 165, 363, 381-383 pp. Juita, A., Dlugogorski, B.Z., Kennedy E.M. and Mackie J.C., 2012. Low temperature oxidation of linseed oil: a review. Fire Science Reviews, 1(3): 1-36. Lazzari, M. and Chiantore, O., 1999. Drying and oxidative degradation of linseed oil. Polymer Degradation and Stability, 65: 303–313. Rivers, S. and Umney, N., 2003. Conservation of furniture, Butterworth-Heinemann, Oxford, 12 p.
 Alizadeh, S., 2012. Survey on ways of Painting Development in the First Part of Qajar Period. 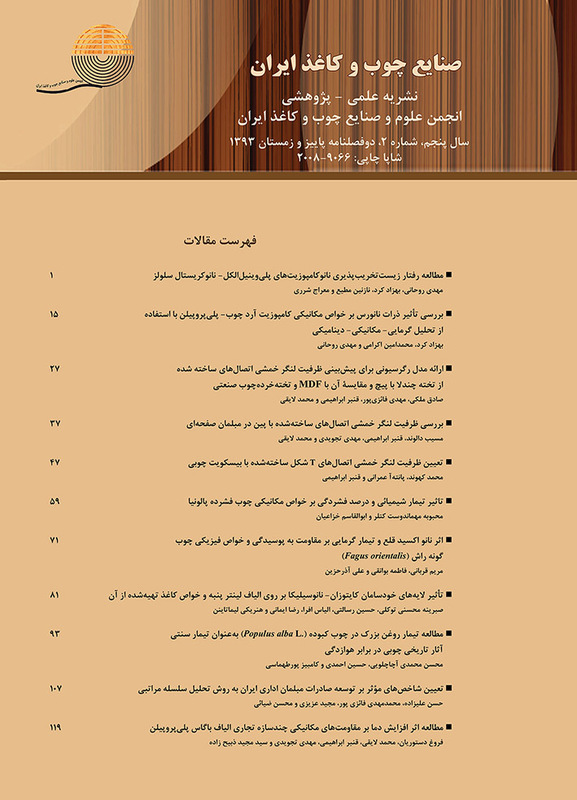 Journal of Faculty of Art, Shahed University, 22: 72-83. (In Persian). Browne, F. L., 1953. Finishing of wood floors. U.S Forest Service Res. Rept. No. 1962, Madison, WI.، 190p. Browne, F. L. 1951. Natural wood finishes for exteriors of houses. U.S Forest Service Res. Rept. No. 1908, Madison, WI. Haggstrom, C. and Sandstrom T., 2013. Alum-treated archaeological wood Characterization and re-conservation, Swedish National Heritage Board, Stockholm, 6-10 pp. Temiz, A., Terziev N., Eikenes M. and Hafren J., 2007. Effect of accelerated weathering on surface chemistry of modified wood. Applied Surface Science, 253: 5355–5362. Williams, R. S. and Knaebe M. T., 2000. Restoration of Severely Weathered Wood. Journal of Coatings Technology, 72(902): 43-51. Mohammadi Achachluei M., Ahmadi H. and Pourtahmasi K., 2014. Patination of Wood with Diethanolamine: Characteristics and its Resistance against Weathering. Journal of Color Science and Technology, 8: 237-248. (In Persian). Wood preservatives: Accelerated ageing of treated wood prior to biological testing, Leaching procedure. British-Adopted European Standard, BS EN 84-97, 2002. Solvent extractives of wood and pulp. TAPPI (US technical association of pulp and paper industry), TAPPI T204 om-88, 1988. Water solubility of wood and pulp. TAPPI (US technical association of pulp and paper industry), TAPPI T207 om-88, 1988. Ajuong, E.M.A. and Breese M. C., 1997. The Role of Extractives on Short-Term Creep In Compression Parallel To The Grain of Pai Wood (Afzelia Africana Smith). Wood and Fiber Science, 29(2):161–170. Standard Practice for Xenon-Arc Exposure of Plastics Intended for Outdoor Applications. Annual Book of ASTM Standard, 08.01, D2565-99, 2008. Johnston-Feller, R., 2001. Color science in the examination of museum objects: nondestructive Procedures, Getty, Los Angeles, 34-36 pp. Chang, H.T., Yeh T.F. and Chang S.T., 2002. Comparisons of chemical characteristic variations for photodegraded softwood and hardwood with/without polyurethane clear coatings. Polymer Degradation and Stability, 77: 129–135. Panov, D., Terziev N., Daniel G., 2010. Using plant oils as hydrophobic substances for wood protection. The International Research Group on Wood Protection, IRG/WP 10-30550. Schneider, M. H., 1980. Hygroscopicity of Wood Impregnated with Linseed Oil. Wood Science and Technology, 14: 107-114. Humar, M. and Lesar, B., 2013. Efﬁcacy of linseed- and tung-oil-treated wood against wood-decay fungi and water uptake. International Biodeterioration & Biodegradation, 85: 223-227. Hon, D.N.S., 2001. Weathering and Photochemistry of Wood. In: Wood and cellulosic chemistry, 2nd ed., Marcel Dekker, New York, 513-546 pp. Derrick, M. R., Stulik, D. and Landry, J.M., 1999. Infrared spectroscopy in conservation science. Getty, Los Angeles, 85, 185 pp. Pavia, D.L., Lampman, G.M., Kriz, G.S., and Vyvyan J.R., 2008. Introduction to Spectroscopy, 4th Ed., Cengage Learning, Belmont, 62-64 pp. Colom, X., Carrillo, F., Nogues, F. and Garriga, P., 2003. Structural analysis of photodegraded wood by means of FTIR spectroscopy. Polymer Degradation and Stability, 80: 543–549. Yamauchi, S., Sudiyani Y., Imamura, Y. and Doi, S., 2004. Depth profiling of weathered tropical wood using Fourier transform infrared photoacoustic spectroscopy. Journal of Wood Science, 50: 433–438. Sudiyani, Y., Imamura, Y., Doi, S. and Yamauchi, S., 2003. Infrared spectroscopic investigations of weathering effects on the surface of tropical wood. Journal of Wood Science, 49: 86–92. Tolvaj, L. and Faix, O., 1995. Artificial ageing of wood monitored by DRIFT spectroscopy and CIE L*a*b* color measurements. 1. Effect of UV light. Holzforschung, 49: 397–404. Anderson, L.E., Pawlak, Z., Owen, N. and Feist, W.C., 1991. Infrared Studies of Wood Weathering. Part II: Hardwoods. Applied Spectroscopy, 45 (4): 648-652. Muller, U., Rätzsch, M., Schwanninger, M., Steiner M. and Zobl, H., 2003. Yellowing and IR changes of spruce wood as result of UV-irradiation. Journal of Photochemistry and Photobiology B: Biology, 69: 97–105. Rosu, D., Carmen-Alice, T., Bodirlau, R. and Rosu, L., 2010. FTIR and color change of the modified wood as a result of artificial light irradiation. Journal of Photochemistry and Photobiology B: Biology, 99: 144–149. Bjarnestad S. and Dahlman O., 2002. Chemical compositions of hardwood and softwood pulps employing photoacoustic Fourier Transform infrared spectroscopy in combination with partial least-squares analysis. Analytical Chemistry, 74: 5851–5858. Hon, D.N.S., 1991. Photochemistry of wood. In: Wood and cellulosic chemistry. Marcel Dekker, New York, 525–555 pp.